Apparently Yahoo has caught the bizarre marketing bug. Today the company has launched “Start Wearing Purple”, a campaign that is trying to capitalize on the color’s reported association with “innovation and imagination” (I always thought it was tied to royalty). Purple has long been Yahoo’s official color, though the logo displayed on its homepage is now a striking red. The campaign is centered around the web portal Start Wearing Purple, which includes features like “Purple Picks” – a daily series of links to things which the Yahoo team has deemed Purple-worthy. There’s also a special Flickr Account celebrating all things purple. And over at Purple Pranks, you can watch a few bizarre setups led by Improv Everywhere’s Charlie Todd. Highlights include an elevator full of people singing a song about their favorite color whenever a stranger walks in. The coolest component of the campaign is Purple Bikes. 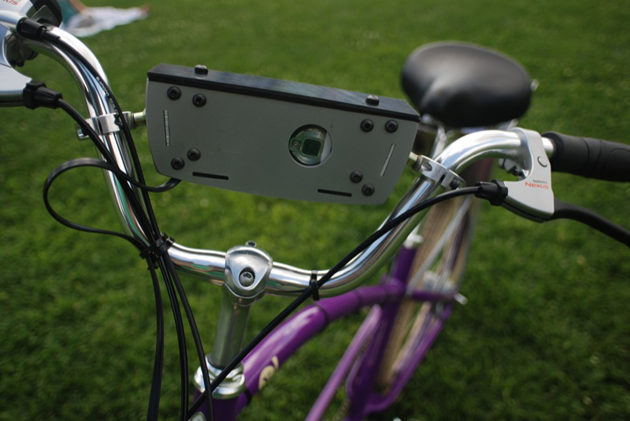 Yahoo has outfitted a fleet of 20 purple bicycles with solar powered cameras, GPS, and mobile Internet connectivity, which are now making their way across a dozen cities around the globe. The bikes will be taking (and automatically tagging) snapshots every sixty seconds, which chronicle each traveler’s journey on a special Flickr map. You can read more about the Purple Bikes over at CrunchGear. So is Start Wearing Purple a total bust? Major corporations launch marketing campaigns like this all the time in order to increase brand awareness and show their users that they have a soul. And as far as these campaigns go, Yahoo seems to have done a good job – the improv videos are funny, the bikes are cool, and the site is fun to play around with. Still, I can’t help but wonder if the marketing dollars could be better spent convincing me to actually use Yahoo once in a while.